The Real Alcazar royal palaces and gardens complex in Sevilla is one of the top sights to see in Andalusia and all of Spain. 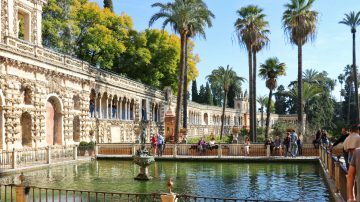 The Real Alcazar de Sevilla comprises several regal palaces and extensive gardens that were used by the Spanish royals from the 13th century to the present. 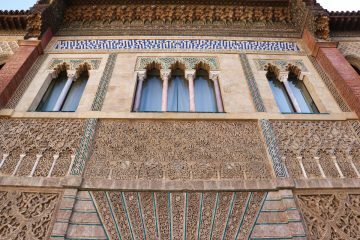 Visitors see several palaces with the highlight the Mudejar palace built in the Moorish style for the catholic king Pedro I. Guided tours are optional and visitors may freely visit the ground floor of the various palaces as well as roam the extensive gardens. Buy tickets in advance. 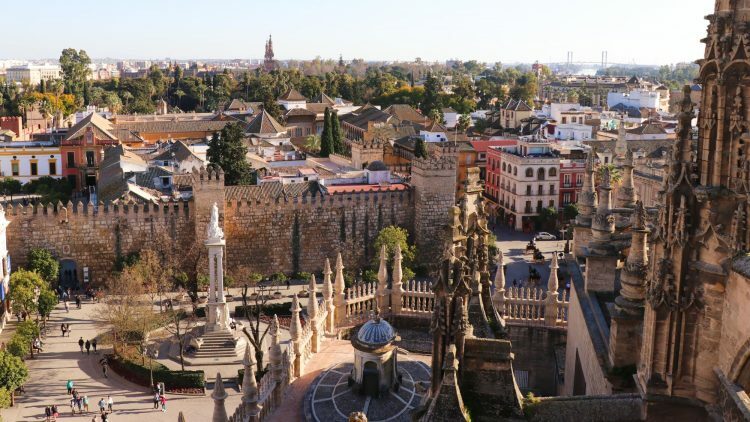 In the heart of Seville, across the plaza from the magnificent Gothic cathedral, a series of royal palaces and extensive gardens are enclosed by an impressive fort-like outer wall. This is the Real Alcazar that served as a royal residence from the 10th century to the present. The King of Spain still stays here when visiting Seville making the Real Alcazar the oldest still in-use royal palace in continental Europe. 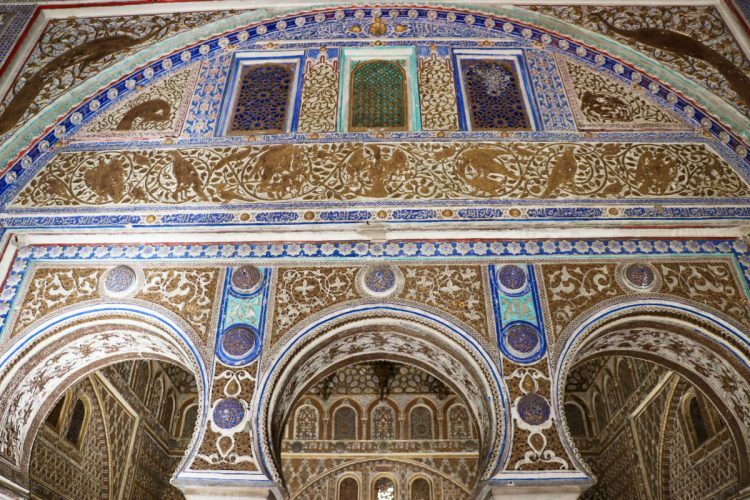 Although only a small part of the original Islamic-era Almohad palace survived, the main attraction is clearly inspired by the Moorish style: the 14th-century Palace of King Pedro I — a masterpiece of Spanish Mudejar art. Other Catholic rulers preferred the more conventional Gothic and Renaissance styles while small parts are Baroque and Neoclassical. From the Islamic era (914 to mid-13th century, only the Courtyard of Yeso remained unaltered. Following the conquest of Seville, Alfonso X erected the Gothic palace during the mid-13th century. This palace was damaged during the Lisbon earthquake of 1755 and repaired with a baroque facade facing the Patio del Crucero. The main attraction, the Mudejar palace of Pedro I was constructed between 1356 and 1364. 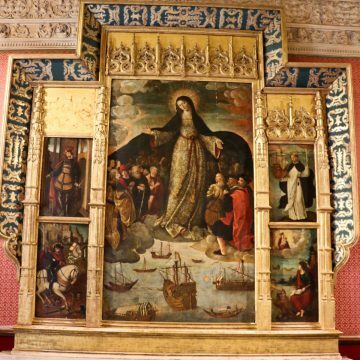 Seville, as the dedicated port of entry of trade from the New World in the 16th and 17th centuries was of tremendous economic importance. The kings frequently stayed with one of the memorial events here the marriage of Carlos I of Spain (or Holy Roman Emperor Charles V) with Isabella of Portugal in 1526 that united the Iberian Peninsula. More recently, it was also used a film location for the Games of Thrones – several thematic tours are available. Real is Spanish for royal — the e and a are pronounced separately. Alcázar is Spanish (derived from Arabic) for fort, castle or palace and is usually used for such structures in the Moorish style. 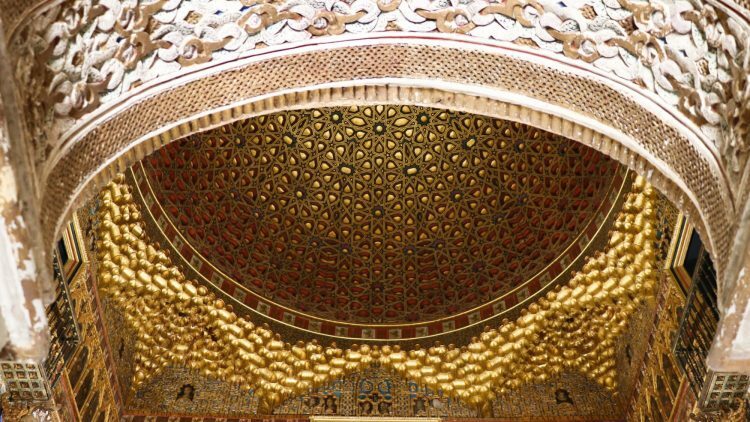 The Mudéjar style combines typical Islamic architectural and decorative elements with the Catholic Romanesque style. 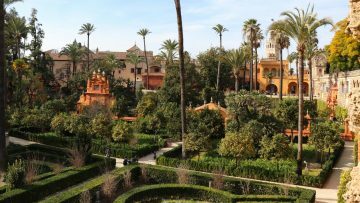 A visit to the Real Alcazar may be divided into two distinct aspects: the palaces and the gardens. There is no one-way system and sights may be seen in any order and multiple times. However, for the buildings it is quite sensible to follow the numbers on the free map to not miss out the spaces that are open to the public. Palacio del Yeso – the only surviving part from the Islamic era. Casa de la Contratacion – the house of trade where explorers reported back. The entrance to the Real Alcazar complex is via the Lion’s Gate (Puerta del Leon) that leads to the Patio of the Lion (Patio del Leon). Although the name dates from the Islamic period, and the fortified walls are in the Almohad caliphate style, the tiles with the crowned lion are only from the late 19th century. The columns and the wall and arches on the far side that gives access to the rest of the complex are amongst the oldest parts of the complex. To the left of the walls, is the Palace del Yeso. Pass through the Mudejar-style Court of Justice erected by Alfonso XI to the patio of Yeso. Although reworked, this courtyard is the only significant part of the complex that was part of the original Moorish palace. 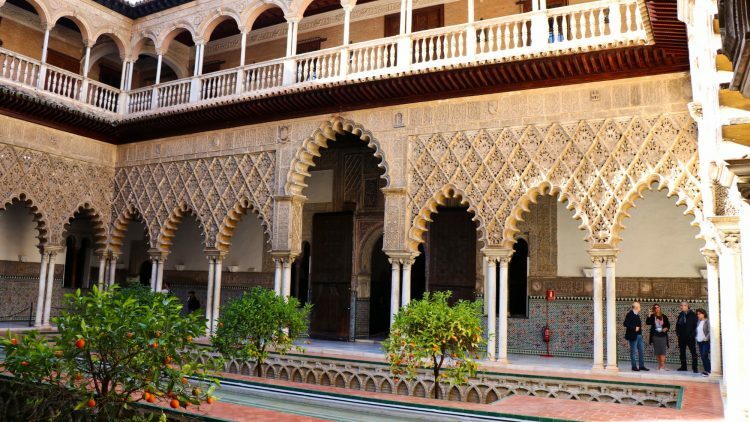 The main Mudéjar palace towers over the Patio de la Monteria but it worth first seeing the Casa de la Contratacion (House of Trade), which was created by the Catholic kings in 1503 to regulate the trade with the colonies and overseas territories. The large Admiral’s Hall (Cuarto del Almirante) was originally used as a reception hall where explorers reported back to the admiralty. Behind the Admirals’ building is the Casa del Asistente that houses mostly service quarters and rooms. It is often very quiet in here as tour groups usually skips this building. The decorations here are less impressive than the main palace but still worth a peak, even if just to escape from the crowds. A well marked staircase leads to the second floor to visit the optional Royal Apartments (Cuarto Real Alto) that may only be seen on a separate ticket with strict time-slot reservations. The tour by audio guide takes half an hour — security guards move visitors on so no lingering in room. On view are only 15 public rooms. Although these rooms have historic names referring to amongst others Isabella of Castilla and Pedro I, most of the furniture and decorations are from the 19th century. Although interesting, the rooms are not particularly impressive compared to other palaces in Europe. 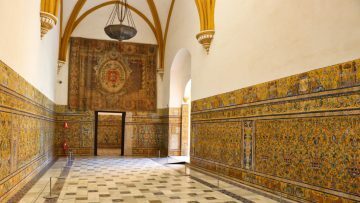 The absolute highlight of the Real Alcazar is the Mudejar palace of King Pedro I (Peter the Cruel or the Just, depending on who’s telling the story). His political and personal life was complicated, including being married to three women at the same time and ultimately being murdered by his half-brother. 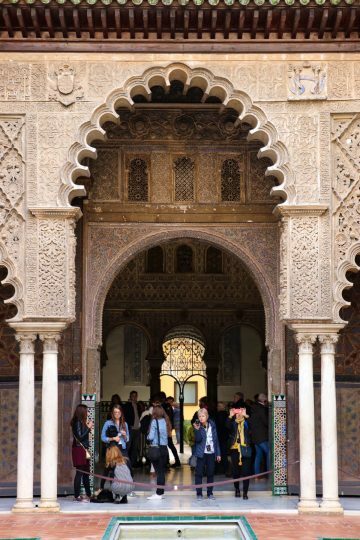 This magnificent palace was built for Pedro I by Moorish artisans from Granada. 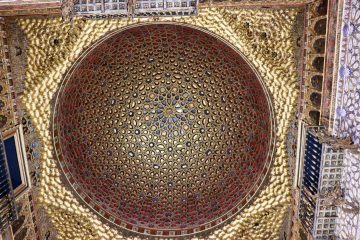 In contrast to the Alhambra in Granada that was used by the Moorish rulers of al-Andalus, this palace was built by Moorish builders (mostly from Granada and Cordoba) for the Catholic king in the Mudejar style that combined both Islamic and Christian style elements. 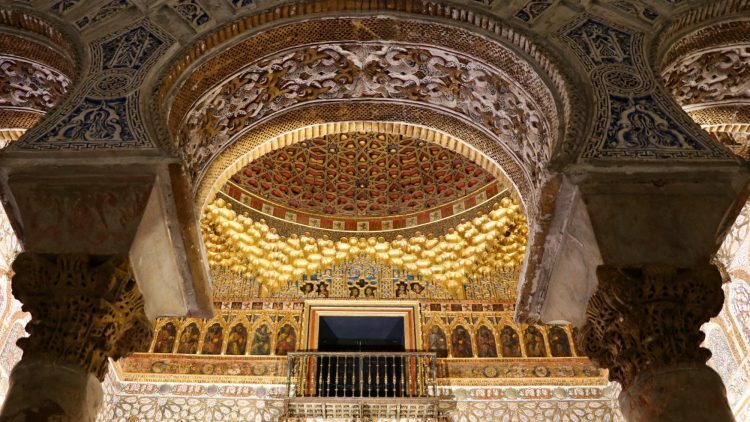 This palace, as well as the large-scale preservation of the Mezquita in Cordoba and the Alhambra in Granada, confirms the high regard the Spanish rulers had for the Moorish style and civilisation. Many of the Arabic writing in the wall decorations are typical Islamic expressions not usually associated with a Christian palace, while the depiction of animals is clearly not typical Islamic. The palace is unfurnished with the attraction the opulent yeseria decorations, horseshoe shaped arches, tiles, and above all magnificent ceilings. None more impressive than the half-orange cedar wood cupola in the opulent Salon of the Ambassadors — it was built to impress and continued to do so. The cupola was only completed in 1427 by Diego Ruiz. At the heart of the palace is the Patio de las Doncellas — a large courtyard measuring 21 x 15 m with reflecting pond flanked by arched galleries on all four sides. The upper stories were added in the mid-16th century in a Renaissance style. Some rooms have equally impressive Renaissance coffered ceilings decorated with typical symbols of the Spanish royalty — lions for Leon, castles for Castile and the impressive Habsburg coat of arms of Charles V. Especial noteworthy are the Salon with the Ceiling of Charles V (Salon del Techo de Carlos V) and the Salon with the Ceiling of Phillip II (Salon del Techo de Felipe II). The birds here on the Arch of the Peafowl were originally brightly colored too. 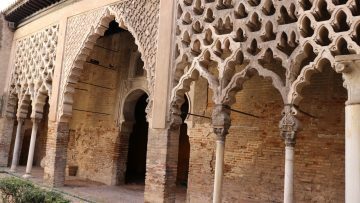 The ochre Gothic Palace is almost a century older than the Mudejar masterpiece. It was erected by Alfonso X between 1252 and 1284 but modified through the centuries and repaired after extensive damage following the Lisbon earthquake. The Gothic vaulting makes the ceilings less interesting than those of the Mudejar palace with the main attraction here the tiled walls with azulejos from the 16th century. 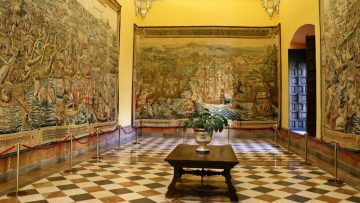 The palace also has large tapestries depicting the conquest of Tunis (1535). Charles V took painter Jan Cornelisz Vermeyen on his campaign to paint the events – Instagram in 16th century. Tapestries of these paintings were made in Belgium in period but the tapestries on display are copies produced in Spain in the 1730s. Note the map of the Mediterranean from a Spanish perspective with south on top rather than north as is the current norm. 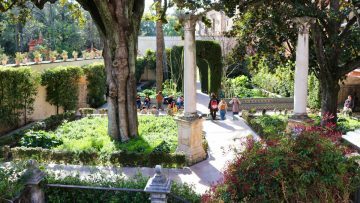 The extensive gardens of the Real Alcazar in Seville is a joy to explore in all seasons. In spring and summer it is a riot of color. Even in late winter, much greenery and citrus are still seen. The park layout changed several times through the centuries but sill have a variety of styles. The smaller formal gardens closest to the palaces are the more intimate and often almost like courtyards. Further away the style changed more to an English landscape garden. Water features, sculptures and other decorations are scattered through the park to provide entertainments and different aspects. Orange, lemon and palm trees abound. For a fine aerial view of the gardens walk along the Galeria del Grutesco (Grotto-style gallery) built on the former defensive walls. Close to the palaces is the Mercury pond — the small bronze Mercury sculpture is from 1576. Deeper in the garden is the Pabellon de Carlos V (Pavilion of Charles V). It is beautifully decorated with 16th-century tiles. The Real Alcazar opens daily at 9:30 and closes at 17:00 from October to March and 19:00 from April to September. The best times to visit is during the first hour or in the afternoon — tourist groups and bus parties are more common in the morning. Later in the afternoon the palace will get progressively quieter but don’t leave it to late — various buildings start to close around half an hour after the above stated last admission times. 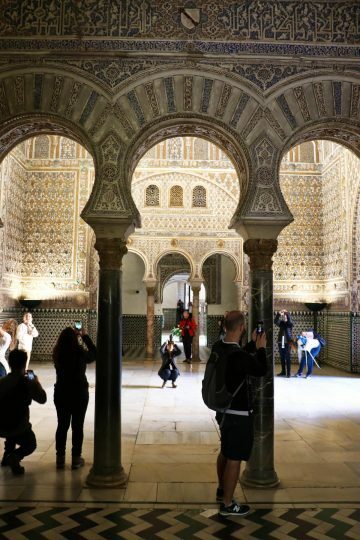 See also Tips on Visiting the Real Alcazar in Seville. General admission to the Real Alcazar is €11.50. Students 17 to 25 and seniors over 65 pay €3. Admission is free for children under 16 and the last hour for all on Monday. The Royal Apartments adds €4.50 per person — no discounts, even for children. 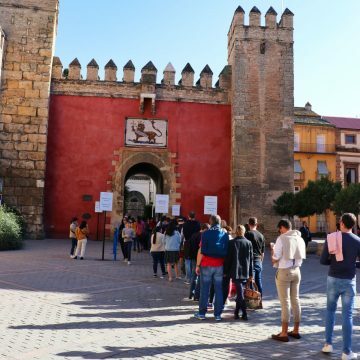 Buying advance admission tickets online cost only €1 more and are almost essential to see the Real Alcazar – ticket lines are horrendous for visitors without time-slot reservations. A wide variety of guided tours are also available. See Buying Tickets for the Real Alcazar for more details and options. The Real Alcazar is across the Plaza Triunfo from the magnificent Gothic Seville Cathedral. Veer slightly to the right when walking from the church. The entrance is via the Lion’s Gate (Puerta del Léon) — a red wall with a lion above the gate. Queue to the right to buy tickets and observe while waiting those with time-slot reservation tickets simply strolling in at the given hour.